The New II stage decompression board for Acety-lene for Glass production is studied to ensure the best efficiency, safety and a continuous feeding to the molds. As requested the system has reduced dimensions (respect the old version) for a more easy installation. It is built as expected by UNI EN ISO 11114-1 e UNI EN ISO 11114-2 for compatibility, aluminium and stainless steel for metallic parts and PTFE for non metallic ones. 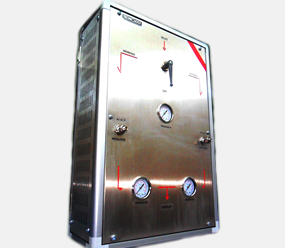 The decompression board is studied to operate with a by pass system for pressure regulators in order to ensure a continuous work, even during maintenance service. Inside the system are instal-led two electric valves (24Volt), one for each lines, connected to a pressure switch in order to stop feed of gas in case of problem. Specific flashback arrestors are installed in order to ensure the best safety. On the front panel there are al the valves needed to control ant set the Acetylene flow. With the decompression board we will supply con-formity declaration and test report.